Whether you're looking for a quick and healthy staple for breakfast, a snack to get you through the day, or simply a slightly unconventional dinner, eggs can be a nutritious addition to your diet. An inexpensive source of protein, eggs also provide vitamin A, iron and selenium. The way you prepare an egg affects its calorie and fat content, but most of the nutritional value is retained. A hard-boiled egg is cooked by placing an egg, shell and all, in boiling water for about 14 minutes, or until the yolk and whites are firm. 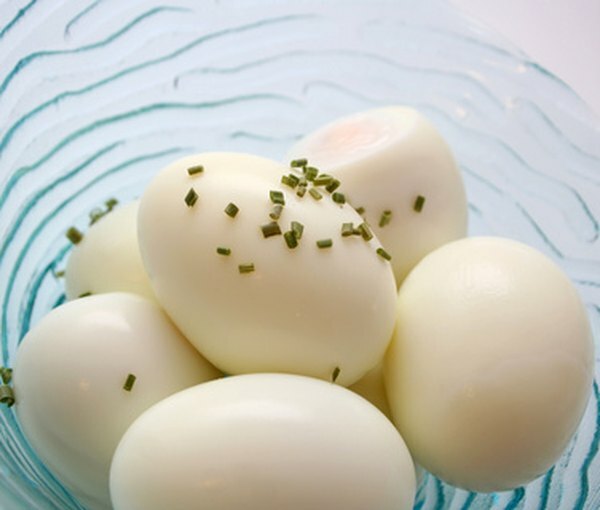 Hard-boiled eggs may be eaten alone, chopped and made into an egg salad or used as a topping on green salads or soups. Fried eggs are prepared by cracking a whole egg into some sort of fat--butter, bacon grease or vegetable oil. The egg may be cooked through by basting it with the fat in the pan, or flipped to brown it on both sides. One hard-boiled egg has 77 calories, while a fried egg has 90 calories. A hard-boiled egg provides 5 grams of fat, 2 grams of which are saturated. A fried egg cooked in vegetable oil provides 7 grams of fat with 2 grams saturated. Using saturated fat to cook the egg, such as butter or bacon grease, will increase the saturated fat content of the egg as well. Both egg preparations provide 6 grams of protein. A fried egg is slightly higher in iron, with 5 percent of the recommended dietary allowance, versus 3 percent for a hard-boiled egg, based on a 2,000-calorie diet. Either egg preparation provides between 2 and 3 percent of the RDA for calcium and 10 percent for phosphorus -- two minerals important for healthy bones -- as well as 14 percent for riboflavin and 11 percent for vitamin B-12. Both hard-boiled and fried eggs contain 22 percent of the RDA for the trace mineral selenium, which acts as an antioxidant to scavenge disease-causing free radicals. An egg contains about 210 milligrams of cholesterol, regardless of whether you fry or hard-boil it. The American Heart Association advises limiting cholesterol intake to 300 mg or less daily. One fried or hard-boiled egg may fit into a heart-healthy diet, if you limit other sources of cholesterol on days you choose to eat a fried or hard-boiled egg.